The Suunto Spartan Sport Wrist HR has a lot going for it. It's a great watch for those playing outdoors, but it falls down on accuracy and consistency with that new wrist-based HR tracker. The biggest claim with the Spartan Sport Wrist HR is that it's the first watch with heart-rate that Suunto has produced. While it joins a family of capable devices, that removes the need for a chest strap, making it appealing to a wider range of athletes. That's a general trend across the industry and although heart-rate chest straps are more accurate, the convenience of a wrist-based tracking system seems to be winning. Cases in point: Polar is also shifting heart-rate reading to the wrist, as is Garmin. That sees the Spartan Sport Wrist HR multi-sport watch up against some serious opposition from those established rivals, as Suunto looks to make a bigger impression. Does it succeed? Suunto's history lies in navigation, from conventional compasses evolving to the wrist-worn compass favoured by divers. There's still a hint of the compass in the design of the Spartan watches, with the bezel having four nubbins around the dial that remind us of compass points. We'll come to the actual digital compass functions later, but from a design point of view, it's worth noting that this is a large watch, about 16.8mm thick and with a diameter across the body of about 50mm. There's a chunky but comfortable strap and despite the size, the watch only weighs 74g. In sports watch terms that's large, but it's not alone in that sense: the Garmin Forerunner 920 XT is similarly large, while the incoming replacement for that watch, the Forerunner 935 is only a few millimetres smaller in all directions. We found the Suunto felt good to wear and have been happily wearing it for a month without the size worrying us. If you like smaller watches or have smaller wrists, then you might want to look elsewhere. But the size brings an advantage: it's easy to press the three right-hand buttons on the move, so the Spartan avoids being too fiddly. It's touch-enabled too, but there's a lean towards the buttons for stopping and starting activities, as well as confirming selections. That bezel is stainless steel for protection, sitting atop a polyamide body with a mineral glass display. Available in a number of colours, we suspect the Blue or Sakura versions will fare better than the black in this regard. The only downside we've found is of the silicone strap: it likes to collect dust and debris, so we've found ourselves rinsing it off regularly, or it always looks messy. Not that rinsing or, indeed, submerging is an issue: the Spartan is waterproof to 100m, so is suitable for divers and generally happy in all conditions. Having a big display means you can easily see a lot of information, which is generally what athletes want. You don't want to have to swipe through a lot of screens to see the important stuff, most of which is presented on the main sports screen. For running, that means time, distance, pace and heart rate are displayed, with the option to swipe through to further different information. For swimming there's distance and time, for example, to keep things simpler while in the water. Tapping the display will pop-up battery and current time, the latter a metric we always like - "is it time to go home yet?" "No, keep running". There are multiple additional screens, too, including routing, averages rather than current stats, plus things like a heart-rate graph that long distance users might find useful (but it's fairly difficult to interpret when you're on the move and tired out). You can also lock the display and buttons, so that if you're doing something where buttons might get pushed or the screen swiped by accident, you can lock it to a single display with a long press of the bottom button. When that's done, any button press will then illuminate the display so you can see your data. One option we particularity like is being able to choose light or dark themes. Not only does this cater for personal preference, it means you can pick the setting that gives you the best visibility for the conditions you're exercising in. We find the light theme suits us better during activities, returning to a dark theme when not actually training. There's a backlight, too, which will dim leaving an "always on" state, waking up when you press a button. If the watch is off your wrist and doesn't move, the screen will turn off completely, which no doubt helps that 10-day casual battery life. The display is colour, but it doesn't make a huge use of the available palette. Some colours are used for highlights here and there, with the main use of colour to present graphs of your workout, or in big red or green banners to indicate which button is for pause and which is for stopping a workout. The screen's 360 x 360 pixel resolution is fairly high as these devices go, but the Suunto Spartan Sport display doesn't attempt to give you the sort of visuals the Apple Watch will, preferring to keep things simple. There's a choice of watch faces, but nothing hugely exciting, giving you the option of analogue-style hands or digital number readout, plus a steps count should you wish. Many of the watches we look at are designed primarily for running first, perhaps adapting that for cycling and walking, along with giving you a selection of other activities. The Suunto Spartan watches position themselves as devices for the multi-sport athlete and come with a comprehensive list of pre-installed activities. When setting up your profile you can add or remove the activities that you do regularly, so that the watch only contains what you need, and you don't have to flick past martial arts, frisbee or cross-country skiing to get to what you're actually going to do. Also on the list is orienteering, adventure racing, obstacle racing and triathlon - meaning you're well covered, no matter what your sport of choice. We like that there are different types of running and swimming, different options for indoor cycling or running, and the unusual stuff you can add when you're on holiday - like stand-up paddle boarding, for example. For some, the Suunto will basically be bought as a heart-rate tracking device, just to keep track of what happens to your heart during a session, but at least when you look back at your stats you'll know that your weight training session is tagged as such, so the data is valid, and you don't have to put in a hike as a run and skew all your data. As has been the trend across a lot of devices recently, the Spartan Sport will give you VO2 max and EPOC figures in the summary of your workout, plus your estimated recovery time. This last of these is useful (Polar gives you similar feedback in Polar Flow) because it serves as a reminder about the impact that the workout is having on your body, helping beginners pick the right intensity and more experienced users avoid over training. Recovery is based on averages, so those who are super-fit might find that they recover faster than the watch recommends. Within all the different activities it's possible to set intervals (where distance is being measured) and these are easy to set from the start of a new activity. The Spartan Sport Wrist HR's big focus is that heart-rate sensor on the rear. This means there's a small bump on the inside to press the optical sensors against the skin. That might sound uncomfortable, but it's standard practise now and perfectly comfortable to wear. Generally speaking, optical heart-rate sensors on the wrist aren't as accurate as those you wear as a chest strap - the latter being what the sister model, the Spartan Sport, uses. Typically, there can be some extraneous results or a response time that's slower than chest straps. In the case of the Suunto Spartan Sport Wrist HR we got quick heart-rate detection, but some fairly inconsistent results, including occasional extreme highs, like running at over 180bpm at the start of a run (and sometimes peaking into the 190s, which suggests that the sensor can get a little confused - we definitely weren't running that hard). Through our testing this trend of peaking at the start and then taking time to settle back down to expected averages became the norm. Looking across results from the past runs, the Suunto certainly looks higher than our average. To verify this, we set it against a chest strap Garmin and the traditional method of taking our pulse against the clock and found that the Spartan was running high. The average is 10bpm higher, but there are peaks at the beginning that are anomalous (Suunto top, Garmin bottom in the graphs below over the same run). That's the biggest weakness of this device: if the heart-rate reading won't settle, then it's not great for those who want to run in particular zones or are focusing on heart-rate training. It also means that things like your recovery time estimate and other stats will be out too. In addition to tracking your heart rate during exercise, the Sport Wrist HR will also trace your heart rate during the rest of the day. This is a move - along with step-tracking - to add a lifestyle element to the device. You can wear it all day and it's doing more than just providing the time. This regular heart-rate tracking will give you a means to examine your resting heart rate and see how active you are during the day. You can also pair the watch with a chest strap if you prefer. While some won't see the benefit of a strap, one thing that it will give you is sensor memory if you use the Suunto Smart Sensor - i.e. the strap can remember and transfer your heart-rate data for your session, so if it gets disconnected it still records - but the point of this type of device is to avoid having to wear that strap around your chest in the first place. With GPS onboard, the Spartan Sport Wrist HR is poised and ready to track your activity. Like heart-rate detection, the GPS is fairly quick to locate the watch and we found that hopping from UK to Spain didn't cause it much of a problem: it found the new location in about a minute after a big move and then locked on in about 15 seconds thereafter. You can also start running/timing before the device locks on, if you really can't wait, although your route will only be traced once it picks up the location. One of the interesting details is that you can change the GPS accuracy - the trio of options are OK, Good, Best - and switch GLONASS on or off. This gives you some choice over how important GPS is to your workout - do you need the exact route, or is a general idea of the distance ok? At the Best setting data is captured every second and the GPS stays at full power. At Good it still logs every second, but is in low power mode between logging. At OK level, GPS is only captured every minute, so is probably best for walking. This all has a big impact on battery life, with Best giving you eight hours of tracking, dropping to 12 hours at Good and 30 hours at OK. As there's no altimeter, that information also has to come from GPS, and if accurate height changes are needed, then you're best off sticking to the Best setting. We chose that Best setting and found that the performance was good in open areas, being accurate enough to reflect things like crossing to the other side of the road. As you approach built-up areas some of that keen accuracy is lost for the precise route, but that's normal. We also found the distance readouts to be as expected, which for many is the important thing. Lap notifications can be given every kilometre, with a brief summary of your performance. Under the navigation section you can also access the compass for directional guidance, but perhaps more useful is the ability to find your location (coordinates) and save that as a POI (point of interest). These can be named with things like home, hotel, camp, big game and a lot more, meaning you can find your way back to something, which is useful if you're exploring a strange location. Aside from POIs, you can also add and create routes using the Movescount companion website. These can be evolved from your own runs, community sourced, meaning you can search in an area and adopt someone else's route, or you can upload GPX files for particular routes - like long walks, for example. The great thing about using your own routes is that you can add them to the route planner and change them on the map, perhaps to make it up to a distance you want to hit. All of this is relatively easy to do through the website, adding some skills that other watches don't offer. In addition, there's breadcrumb route tracking - which gives a detailed view and an overview, so you can find your way back to familiar ground by simply swiping to the navigation screen during an activity - so if you head out into the wilds you can find your way back. Overall, the GPS tracking and route functions are a highlight of the Suunto Spartan Sport Wrist HR. With it being 2017, any device is part of a connected experience. That's true of the Suunto Spartan Sport Wrist HR, which will sync to your phone, letting you view your results in the Movescount app. This app reflects some of the desktop experience visually, which makes the app rather fiddly. 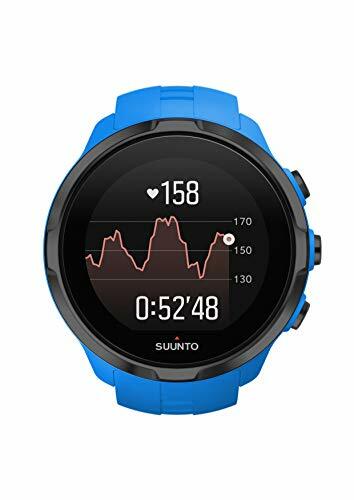 It's a poor cousin to the likes of Polar Flow or Garmin Connect, with Suunto's opening page showing you a loose barchart of activity. The information is all in this app, from the details of your workouts to maps of your routes, but the app is really serving two purposes: it's a home for your data; and a smartphone app for tracking more workouts, should you be carrying your phone rather than using a dedicated watch. Examining what you've done is ok - although the watch will give you that information too - but the maps section of the app seems wasteful. It will show you where you are as well as give you a heat map for other Suunto users' activity. You can't do anything with that information. On the website you can look at the map and find a route that someone else has logged and run it, but in the app you can't. That seems like a missed trick: what better than arrive in a new city and be able to instantly find a route, send it to your watch and start running? We've also had some syncing problems with the app. We can't tell if these are platform related (is it an Android problem?) or related to particular devices (a Samsung Galaxy S7 edge and Galaxy S8+ were slow, a Pixel XL was fine), or just a general issue with establishing connections. We've had some phones that would take 10 minutes before anything would appear - in most cases we'd give up. More recently we've found it getting faster - so perhaps this is a problem that's been fixed? You can connect Movecount to other services, such as Strava, and we've found that you can also connect to Movescount with other services, although it's not as immediately willing to share as something like Garmin Connect. Finally there are smartphone notifications as an option, which are accompanied by a little buzz. This will let you know if you have incoming messages and alerts, with the ability (on Android) to turn off those you don't want. Sounds great, but we found it to be very inconsistent, often going for days without anything, then hitting us with a whole load. Again, this sounds like some sort of connectivity problem between the watch and phone. The Suunto Spartan Sport Wrist HR has a lot going for it. It's a fully-feature activity watch, covering a lot of sports and giving you lots of sensible options to track your activities. The Spartan also gives you some of the strongest route tracking and management options around, making this a device that's perhaps more appealing to the outdoorsman than the out-and-out runner. That's compounded by the fact that the new wrist-based heart-rate sensor can be inconsistent in its tracking and, in our experience, more so than many rivals. Devices like the TomTom Adventurer, while not as all-encompassing, will deliver a better experience. So if heart rate is important to your training, you might be better with the Suunto Spartan Sport along with a chest strap - but there's still a chance that the the Wrist HR's performance can be bettered through software refinement. The Suunto app is also a little lacking compared to Garmin and Polar rivals and could easily be evolved to give you more. At its core, the Suunto Spartan Sport Wrist HR is a great device. It has good battery life, lots of sensible options and is comfortable and enjoyable to use. However, that heart-rate tracking needs to be more consistent to take on the established rivals, especially at this price level. The TomTom Adventurer is similarly pitched at a wide range of activities, but with the great outdoors in mind. It offers many similar functions to the Spartan Sport Wrist HR and while it's less well equipped for some of the navigation options, it delivers much better on heart rate and also offers a barometer for more accurate altitude readings. The Adventurer also supports on-board music and can be connected to Bluetooth headphones, making it a slightly better choice for those who want it mainly for running. Like the Spartan, the app isn't the most sophisticated and it doesn't offer smartphone notifications. It is cheaper at around £210. Garmin goes after the great outdoors with the Fenix 5 and while the companies forthcoming Forerunner 935 will suit the sports set better, the Fenix is designed for those wanting rugged outdoor protection, solidity of build and great battery life. This is paired with great performance from the GPS and heart rate sensor and all pooling into the Garmin Connect app. The downside is that the Fenix 5 is probably the most costly of sports devices you'll find, but it does manage to have an air of elegance about it, looking good with its premium design whether you're up a mountain or pointing at a flip chart.